Sherrod Malone Smith (1891-1949) played 23 years of professional baseball including 14 seasons in the major leagues. Babe Ruth, another left-hander, said that he was, "the greatest pick-off artist who ever lived." He played in Pittsburgh, Brooklyn and Cleveland and in the 2,052 innings he pitched, only two bases were stolen. Smith posted a 115/118 won/lost record in the majors with 21 saves, and a record of 67/39 in the minors. He pitched 30-1/3 innings in three World Series games with a 0.89 earned-run average. His career batting average was .233. In 1916, he pitched against Babe Ruth in a 14 inning World Series games in which Ruth failed to get a hit and struck out twice. Smith doubled once in his five trips against Ruth. "Sherry" Smith was born in Monticello and played town ball in Mansfield, Madison, Elberton, and Newborn before turning pro in 1910. He managed the Macon Peaches in his last pro season in 1932. Smith served in the Army during World War I, and was the Chief of Police in Porterdale and Madison. 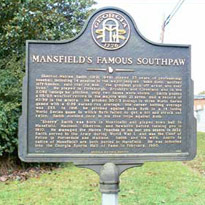 Smith and his wife, Addilu (a native of Mansfield) are both buried in Mansfield. He was inducted into the Georgia Sports Hall of Fame in February, 1980.